One of the great sustained works of genius in 20th-Century American popular art, Peanuts seems deceptively simple. When we think of it, we think of a few iconic tableaux: Charlie Brown on the pitcher’s mound, at Lucy’s “Psychiatric Help” booth, railing at the Kite-Eating Tree, flying through the air as Lucy yanks away the football. Linus practicing Zen with blanket and thumb. Lucy reclined against Schroeder’s piano. Snoopy asleep atop his dog house, or flying dogfights with the Red Baron. Often it was just two of the characters, facing the reader as they leaned against a brick wall, ruminating about life’s mysteries. But this wasn’t all of Peanuts. When you consider that the strip ran more or less every day for about half a century, it’s inevitable that now and then it got weird. The discipline and austerity of Charles M. Schultz’s lines and dots and catchphrases were contrasted with an amazing fertility of imagination that allowed, on occasion, for the fanciful or even, as in the Kite-Eating Tree, the macabre. Here are a few (a very few) other examples. We’re not talking here, incidentally, about any Peanuts homages or parodies, like those in, say, MAD Magazine, though some of these are terrific. Not all of the visions below were actually created by Schultz himself, but all of them are, at least in some measure, “official” products of the Peanuts franchise. 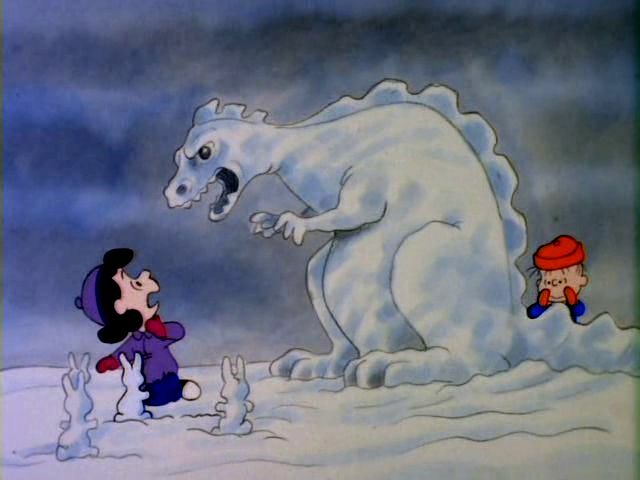 Peanuts is, ostensibly, about children, and children are often into dinosaurs, so it’s only natural that it would feature dinosaurs from time to time. Charlie Brown’s little sister Sally gave school reports on dinosaur species like the Bronchitis, who become extinct by coughing, or the Thesaurus. Lucy once tried to put together a Tyrannosaurus Rex skeleton model only to be infuriated by Linus and Snoopy’s “Dem Bones” song and dance routine. And of course, the Uber-Beagle played at being a dinosaur (“a SMALL dinosaur”) in one of his countless flights of fancy. But the most spectacular dinosaur in all of Peanuts came in a wintry Sunday strip, when Linus, who often showed a savant-like gift for sculpture in snow, sand and building blocks, vented his anger at one of Lucy’s outrages by creating a looming carnivorous behemoth worthy of Bill Watterson’s Calvin and Hobbes out of snow to scare her. The scene was reproduced for TV in a 1983 episode of The Charlie Brown and Snoopy Show (about 7:20 above). The current Peanuts Movie is offered in 3-D, but those of us who grew up in the ‘60s may have already experienced Peanuts in 3-D, as long as we had a View Master. 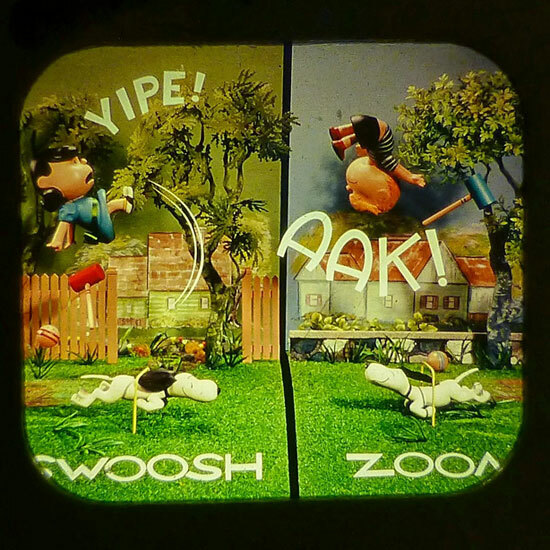 In some of the slide sets, the Peanuts gang, along with Disney characters, The Flintstones, etc., were reproduced as three-dimensional miniatures and photographed on tiny sets. The effect was charming and, at least in the case of Peanuts, the strips were reproduced with painstaking accuracy. It’s hard not to wonder if any of those figures survive. That would be a highly specialized collector’s market. Peanuts sometimes showed a sort of animistic streak, endowing objects with personalities. One of Schultz’s strip-to-strip narratives, from 1965, had Lucy being repeatedly attacked by Linus’ security blanket, come to life a la the M. R. James story “Oh Whistle, and I’ll Come to You, My Lad.” Even Charlie Brown’s baseball glove was once given a weary monologue. But few of these inanimate objects come to life is as memorable as the contentious lawn chair with which Snoopy does battle in the 1973 TV special A Charlie Brown Thanksgiving, all to the accompaniment of Vince Guaraldi’s fine slow-funk jam “Little Birdie.” Those of us with limited manual skills have frequently felt ourselves in Snoopy’s position. Adults are aliens in the world of Peanuts. Except for the face of Beethoven, the idea of the sight of a grownup amongst these characters seems creepy, akin to the “Uncanny Valley” effect in CGI. Even the sound of adults seems wrong, hence the “wah wah” noises used to represent teachers and parents onscreen (although this rule is broken, briefly, in a few of the later and less stylistically strict movies and TV shows). ‘Twas not ever thus, however. Early in the strip Schultz experimented here and there with adults: a pair of hands on a store counter, a brief line from the wings spoken by Charlie Brown’s Mom. 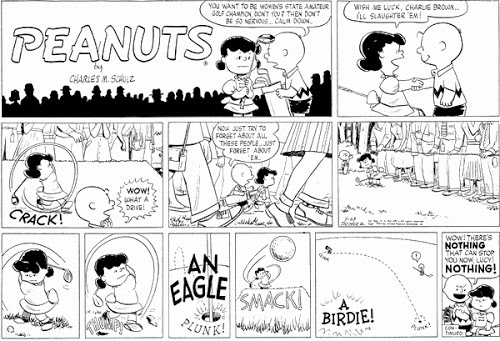 But in 1954, Schultz’s had Lucy playing golf, with Charlie Brown as her caddy, in a couple of linked Sunday strips which included an audience of adult spectators. The cartoonist apparently found them unsatisfactory, as he didn’t include them in his initial collections. They were only reprinted years later. It’s understandable; they’re eerily faceless. 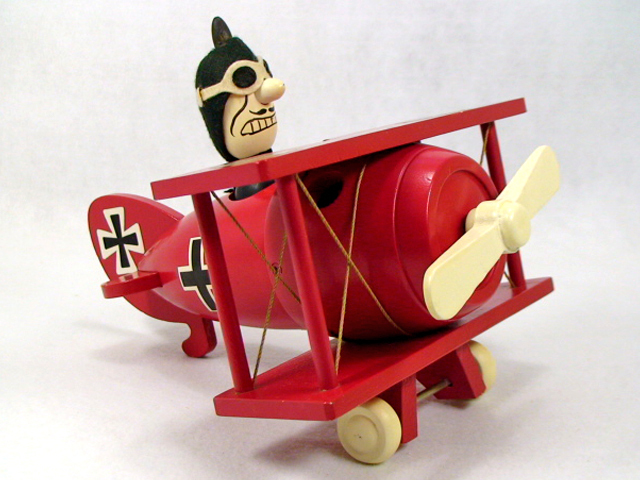 Snoopy’s airborne nemesis the Red Baron, historically the honorific given to the German pilot Manfred von Richthofen (1892-1918), was kept offstage in the strip and the Peanuts TV specials and movies. But he was rendered in 1968 as a music box from Schmid, a companion piece to their Snoopy-as-a-Flying-Ace music box. The Baron’s aircraft is here a biplane, not the Fokker triplane with which he is more often associated. Like much of the world, Snoopy got caught up in the Space Race, becoming NASA’s official mascot for the Apollo program. The test Lunar Module on Apollo Ten was named the Snoopy, while the Command Module was the Charlie Brown. 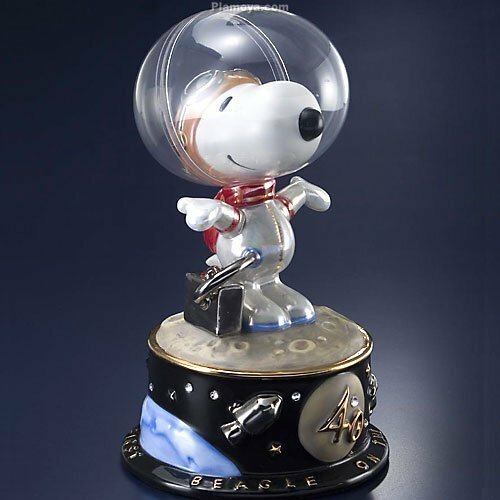 In the strip, Snoopy, as a lone astronaut seated Flying-Ace-style atop his doghouse, became “First Beagle on the Moon” in March of 1969, beating Apollo 11 there by a few months. His space exploits were eventually commemorated by another Schmid music box, which played “Fly Me to the Moon,” and also by a 2009 Kato crafts figurine. Previous ArticleAgents of SHIELD SPOILER Thread: Back, Lash! Next Article New Comic Book Day: GALACTUS IS COMING.